If I asked you to name your top 3 burger chains, what would you say? Mine used to consist of Five Guys, then GBK, then Byron. It is most definitely not like that anymore. Recently my friend Lucy and I booked ourselves a personal shopping appointment in Topshop, Knightsbridge, London. We had a great time, but afterwards, we were hungry. Gal needs food don’t ya know. 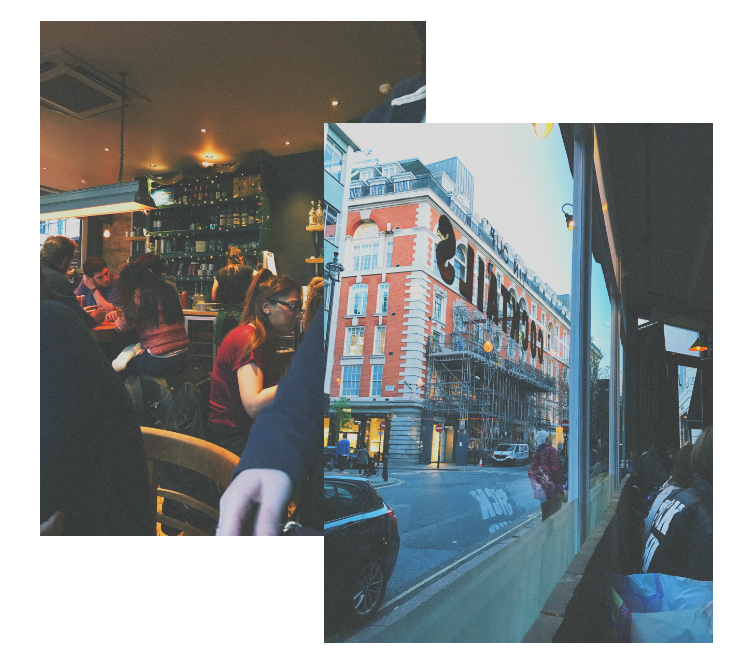 We ended up near Oxford Street, just wandering around being really indecisive about what to eat when we stumbled across Honest Burgers. I’d read a couple blog posts on it and heard it was supposed to be good, so we took a gamble and went inside. The branch we went to was situated on the corner of some fairly quiet back streets. There were a few tables outside, all full when we arrived, and as we opened the front door, it was heaving. I mean absolutely jam packed. This was about 7:30 pm on a Saturday night though, so it was to be expected. A lovely lady greeted us and luckily had one table left for two. It was right in the corner, next to a window. The restaurant wasn't very big at all. The main seating area has a couple of tables in the middle and then lots around the edge. Then you had the seating area with a few tables outside, and the kitchen was down in the basement. It did feel quite cramped, and when I sat down I managed to accidentally barge into people with my Topshop bag (soz), but once we were sat down it was alright. It was cosy. You felt really close to everyone else, and I’m sure if you wanted to you could listen in on the people next to you conversation, but the atmosphere was nice. It felt busy, buzzing, fast-paced, but homely. They brought us the menu (which was wooden - HOW COOL) and I decided to go for a cheeseburger. All burgers are served with rosemary salted chips. We didn’t have to wait long, despite it being super busy, the food came quickly. The first thing I noticed was how cute the plates were. This didn’t feel like we were sat in a restaurant, it felt like I’d come home for tea. It was a bit like going to a relative's house who has really retro bowl/plate things. Well cute. The portion size was spot on. Enough for me to feel pleasantly full, but not so much I felt like I’d eaten a horse. Getting down to business, let’s talk about the burger. This, ladies and gentleman, was something like I’d never tasted before. It was so juicy, so tasty. The cheesy filling and beef patty were so delicious. It tasted like proper homemade grub, and was uh-maz-ing. Sorry Five Guys, you’ve been knocked off the top spot. I should note that burgers are served medium (pink) unless otherwise stated. I had no problem with this, but I guess it might be something to consider if this does bother you. The chips! Oh man, the chips. As I said, all burgers are served with the most beautiful rosemary salted chips you will ever taste. As I was ordering, I thought they sounded nice, but wasn’t too bothered, but when they arrived. Woah. The chips quickly became a hit. Like, even sat here now, I can’t decide what I enjoyed more, the chips or the burger. The whole meal was so hearty and delicious, and I can totally understand why this restaurant is called Honest Burgers. We really weren’t in there for long, and it was busy, but I could have easily sat there munching on chips for the rest of the evening. On this occasion I didn’t try the cocktails (madness, I know, I mean who even am I?) but having a glance over the menu now, they look rather nice. I want to try the mint lemonade. So, next time you’re in London and need a burger, please try here! We stumbled across this restaurant almost by accident and it turned out to be great. And now my beloved Five Guys doesn’t do it for me anymore! #Worthit. What’s your favourite burger place?